Monday, Iowa Gov. 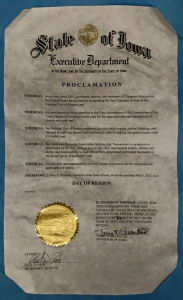 Terry Branstad signed a proclamation establishing Thursday as “Day of Reason” in Iowa. His office gave the proclamation little fanfare, but Linn County Humanists posted an image of the proclamation, which is just now beginning to make the rounds on the Internet (click the image at right for higher resolution). 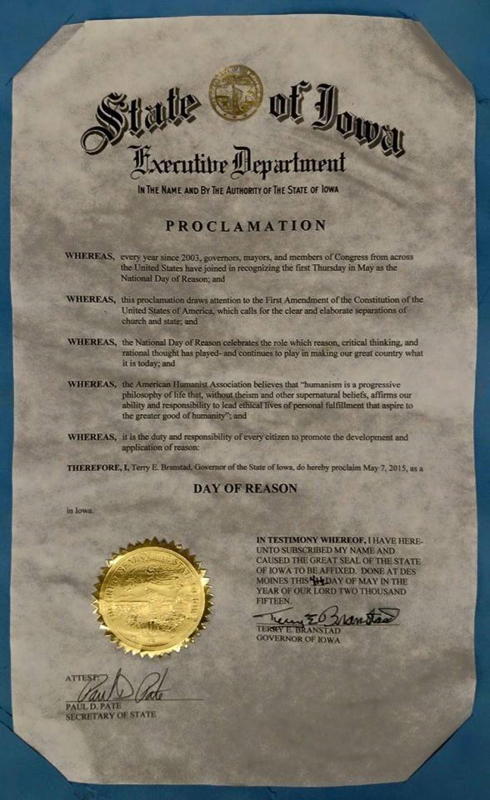 National Day of Reason, established by the American Humanist Association, “celebrates the role which reason, critical thinking, and rational thought has played and continues to play in making our great country what it is today.” The timing of the proclamation was not lost on Iowa Christians, many who spent Thursday celebrating National Day of Prayer, which has been held on the first Thursday of May since 1952. Branstad has previously signed proclamations for National Day of Prayer, and signed one this year, as well, the Governor’s Office confirmed. He signed a “7:14” day of prayer proclamation last year that drew outrage from non-Christians and liberal media outlets.